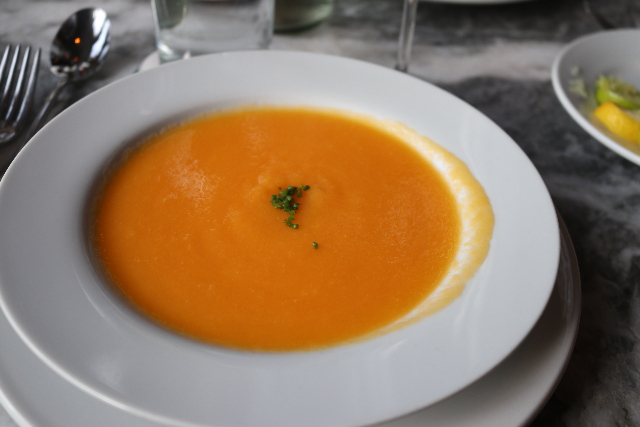 A seasonal chilled cantaloupe soup. Putting a nose to the wine. Bib lettuse with a permesan crisp. 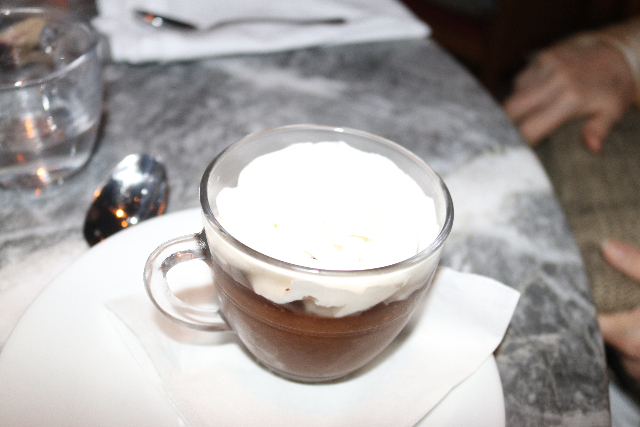 A cup of rich chocolate. 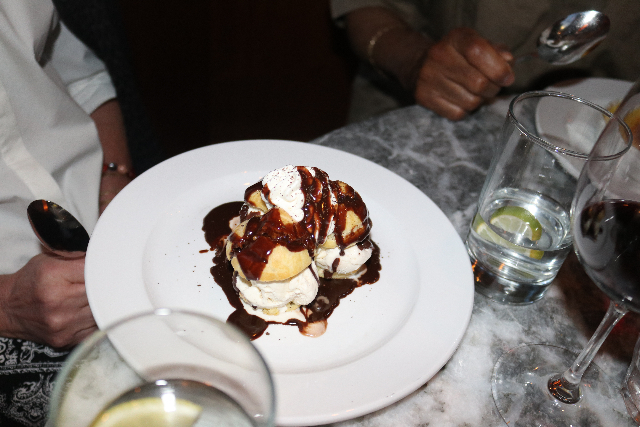 To celebrate a special occasion four of us dined at Zinc in Lenox. It is a renowned destination of upscale visitors catering to urban taste in a rural setting. During our visit the friendly and enthusiastic waiter explained that they were featuring the summer menu. 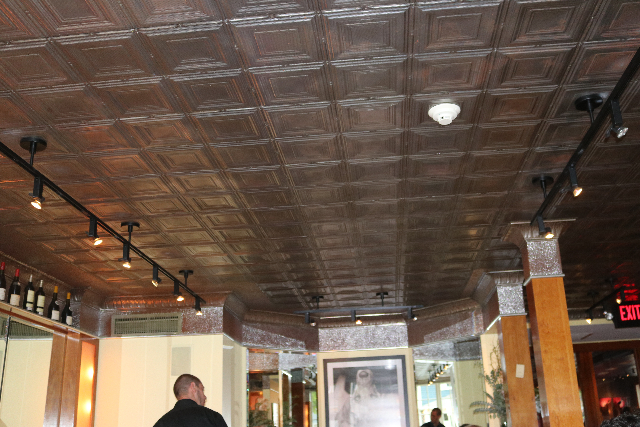 Looking up one notes the old time, tin ceiling, hence, the title Zinc. 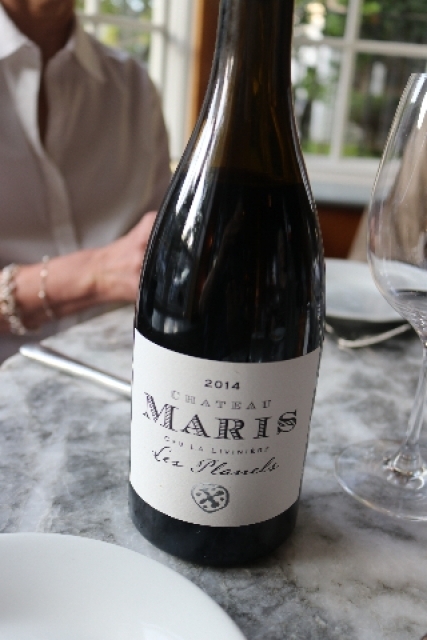 While ordering starters the wine list was perused and 2014 Chateau Maris, primarily Shiraz ($55) was ordered. There was bite when first sampled but the bottle was allowed to sit and bloomed nicely. It is a robustly rich and flavorful wine which complemented the beef. To get the sense of seasons I ordered the chilled cantaloupe soup ($8) and passed it around for all to sample. It was just wonderful with cream and a dash of maple syrup. Perhaps we will give it a go in our kitchen with some variations. 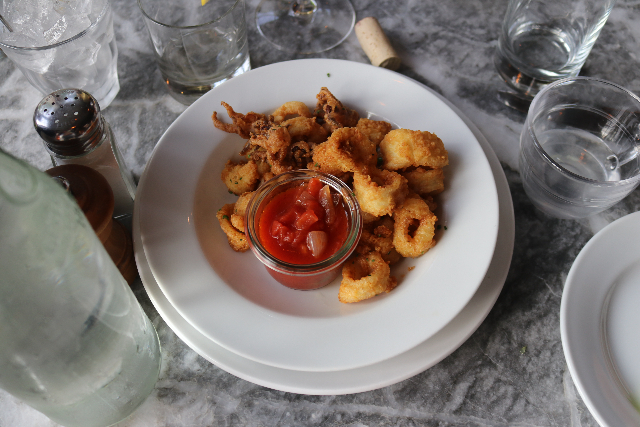 The crispy calamari with puttanesca sauce ($14) to share was undistinguished. The rings were dark and oily and tasted a bit fishy. 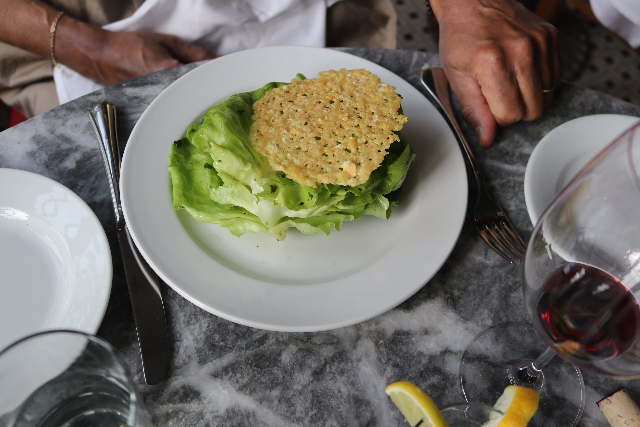 Our friends had bibb lettuce salad ($9) topped with a parmesan crisp. The piece I tried was enticing. We asked for bread and it resulted in a hot, crisp, baguette wrapped in white paper with soft butter. That went quickly and was replaced. It seems that bread is no longer automatic in upscale restaurants. 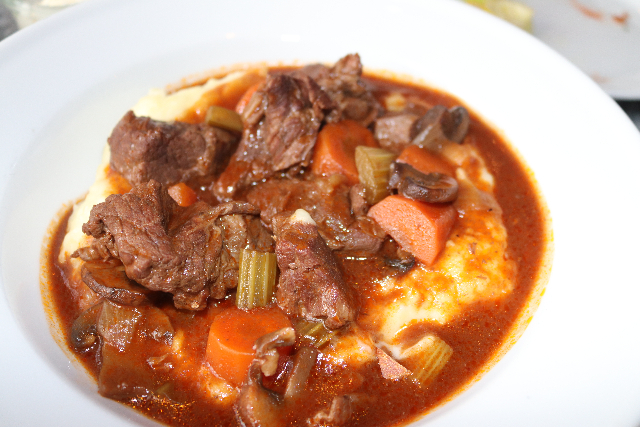 The men both ordered beef bourguignon ($27) which we raved over particularly when paired with the right wine. The meat was tender and flavorful with a nice reduction over a bed of ultra creamy mashed potato. It was sublime dining. 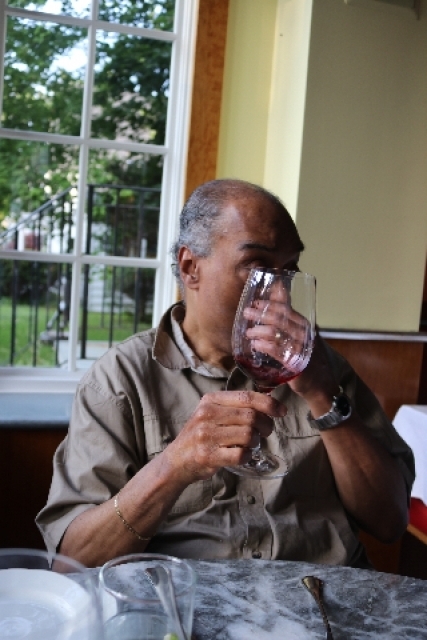 At $26 the serving of trout meuniere proved to be mixed. The two pieces of fish were a bit dry while the topping of fresh crab was generous and tasty. 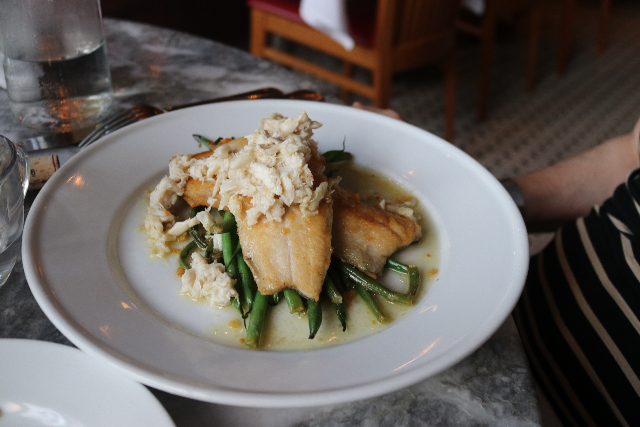 The fish was served over green beans which ranged from soggy to crisp. There should be more attention at the pass when letting such a dish leave the kitchen. 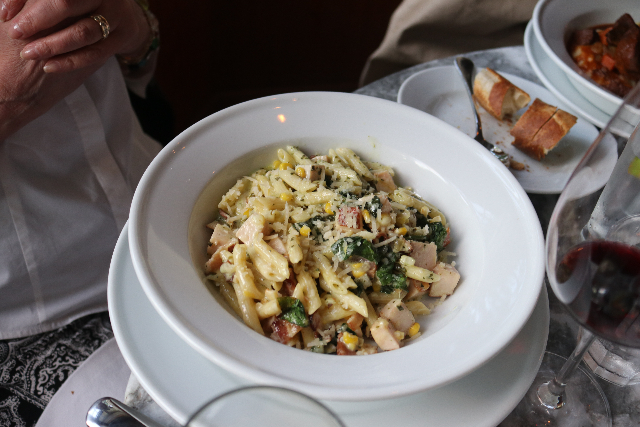 The special of penne pasta with pesto was generous and half went home for another meal. 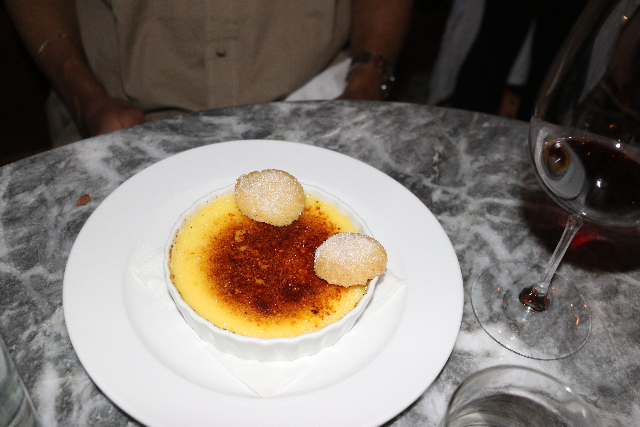 We each enjoyed deserts, our cup of chocolate and whipped cream shared, while the others were cream puff with ice cream and chocolate sauce, as well as, a classic crème brulee. Come fall/ winter we will return for another special meal.